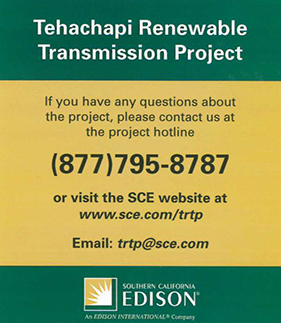 Southern California Edison’s project to underground the Tehachapi Renewable Transmission began in September of 2013 and is essentially complete. Multiple contractors constructed the project in order to reduce the impact on Chino Hills residents. The TRTP line was energized in the fourth quarter of 2016. This project is the first of its kind in the United States. SCE and the City of Chino Hills wants to thank Chino Hills residents for their patience as the final milestone of the project was reached. If you have any questions about the project, please contact SCE on the project hotline at 877-795-8787 or visit the SCE website at www.sce.com/trtp. 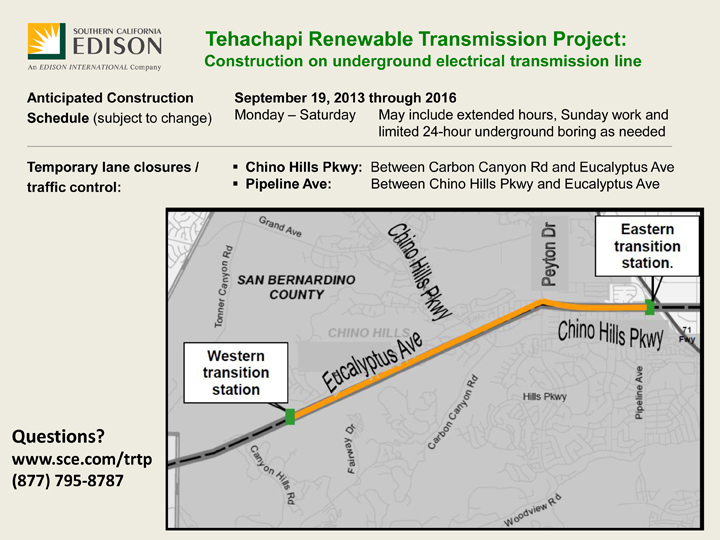 SCE energized the 500kV line, and there are two transition stations; the Eastern Transition Station (Pipeline Ave north of Chino Hills Pkwy) and Western Transition Station (southwest of western end of Eucalyptus Ave).